This excellent series on Conforming to the Mind of Christ continues even deeper. Remember this didn’t just happen overnight, even BISHOP GREGORY LEACHMAN’S worldly battles helped make this possible. 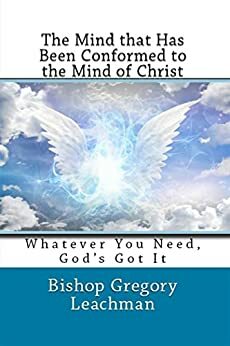 The Lord Jesus just showed GREGORY a better and different approach on how to do it and made him more into Christ’s image through the baptism of the Holy Spirit flowing through him and forever changing him and taking out everything that’s not like God. Some of it is still left but it’s powerless because Jesus is Lord over GREGORY’S entire life and He wrote this just for you! THE MIND THAT HAS BEEN CONFORMED TO THE MIND OF CHRIST is a strong word to learn right, change is a struggle, it’s more of what and how you go through daily life and trying with all you know to stay focused on doing what’s right, after doing wrong most of your life, getting to the Jesus kind of change, not of works lest any man should boast in himself. Don’t forget your good is as dirty, stinky, filthy rage; out of the sewer, everything goes down there. Learn how to smell like Jesus and not like you thank you, we pray you enjoy volume three of this Series.